The West Coast Wildlife Centre won the Tourism and Hospitality Award at the prestigious West Coast Tourism Awards on Friday 26th October. 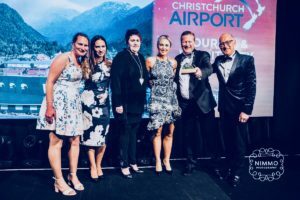 Judged to be the best attraction on the West Coast the Centre team were delighted to accept the award held at Shantytown in Greymouth. The owner Richard Benton acknowledged the partnership with the Department of Conservation and the work of Development West Coast in assisting businesses on the West Coast to reach their full potential. He also thanked his team for all their dedication and hard work in achieving the exceptional conservation goals of bringing the worlds rarest kiwi ( the rowi ) back from the very edge of extinction. He invited all visitors to the region to come down to Franz Josef and visit the attraction – open from 8am 7 days a week. Previous Previous post: HELLO HAAST! Next Next post: Lots of Baby Kiwi Chicks To See ! !